One day recently, I had a fantasy craving. I was just getting so sick of all the contemporaries that I’d been reading, so I decided that I wanted a tiny change in scenery for my next read. So, while browsing through the books at my school’s library, The Scorpion Rules caught my eye. Though I was taking a risk by reading it, I still decided to crave some fantasy. Just as I’d expected, three stars were what came out of this book. I enjoyed it, but only to an extent. There were still a plethora of things that I, the world’s most avid contemporary reader, was bothered by. To briefly synopsize the book, it centred upon a girl named Greta, who is a Child of Peace. In this world of hers, anyone who wants to rule must give up their child for hostage. If Greta can survive until age 18, then she will be freed, but is still willing to make sacrifices. But when she meets Elian, she discovers that she is more powerful than she’d thought. When his country starts a war with hers, they both strive to keep themselves out of trouble. This is yet another story with unmemorable characters, and I hate that! I just want a character that I will be able to remember for once, that is literally all I ask! Greta, the protagonist, was an example of this. Though she was brave, she was practically no different from any other main character in the dystopian novels I’ve read. There was a love triangle in this story (another trope?!) and it was an annoying one, too. Greta was literally going back and forth between Elian and her best friend whose name goes along the lines of “Xia.” The synopsis misleads us in saying that she bonds with Elian, because there are really two love interests in the story. In spite of this, I did appreciate the diversity brought to us in this story with Greta being bisexual and there being mixed cultures. As I write this review, I finished this book ten days ago, and I cannot tell you a single event that happened in this story. That’s how unmemorable this book honestly is! 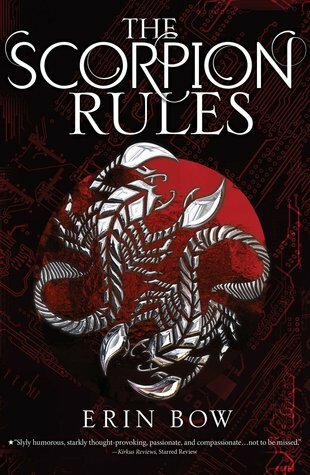 The plot was thrown all over the place and I often found myself quite bored while reading The Scorpion Rules. The one pro I can recall about this book was its writing. Boy, did I fall in love! The writing was mystical, beautiful, and lyrical. I really wish that more contemporaries were written that way! All in all, like what often happens with darker books of this sort, I didn’t fall in love with The Scorpion Rules. Well, I fell in love with the writing, but everything else? Not really. I’m sure that experienced fantasy readers would get more of a kick out of this one- it was flawed, but it still had its good traits. I enjoyed the series but it was not my favorite either. Great review! Great Review! This book does sound interesting but I’m really not sure that I would enjoy it.